The design of conventional cell culture vessels such as culture flasks and multiwell plates does not adequately provide for cell microscopy during cultivation. Relatively simple inverse microscopes have been used in the past to monitor the morphology and number of cells, and the poor visual results simply accepted. Conventional culture vessels can no longer keep pace with the rapid development of microscopes able to penetrate into dimensions that seemed impossible only a short time ago. The thickness, surface and type of the plastic material used and the meniscus curvature of the fluid surface seriously impair the achievement of visual quality. In the past, a workaround was used in which some cells were transferred to a slide; however, this only permitted a brief overview of the current cell status. A further problem in microscopy is the irregular distribution of the cells on the growth surface of conventional culture vessels, caused by the non-planar growth surface and by swirl (e.g. centrifugal forces) generated during pipettage of the cell suspension for seeding. This gap between users' needs and current options is closed by the product μ-Slides, manufactured by the company ibidi GmbH. The product offers an elegant solution to the problem by incorporating a shallow channel in which the cells are seeded. The underside of this channel consists of an ultra-thin gas-permeable membrane enabling cell cultivation to take place in conventional incubators. The membrane on which the cells are grown has outstanding optical properties for both light microscopy and fluorescence microscopy of any wavelength. The membrane has low double refraction and autofluorescence (both comparable to glass) and is resistant to a variety of chemicals including acetone and methanol. The channels end in reservoirs to ensure that cells are adequately supplied with nutrients. The geometry of these culture vessels now enables evenly distributed cells to be microscopically observed and investigated during cultivation itself in outstanding optical quality.The μ-Slide is simply removed from the incubator and placed under the microscope; after examination, it is returned to the incubator. 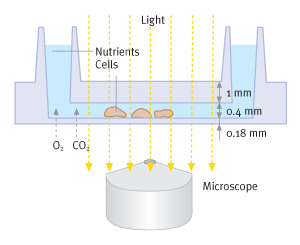 Long-term live cell imaging can be performed with add-on incubation chambers for conventional microscopes or in special microscopes with integrated incubators. The desire to perform transfections directly in μ-Slides primarily arose in connection with expression of fluorescent fusion proteins in the cell, "knockout" of proteins expressed by the cell and observation of the associated localization processes. However, extensive problems arose in attempts to perform these transfections in μ-Slides using conventional reagents and protocols. One cause is the difference in ratios of plastic surface to medium volume between regular culture vessels and μ-Slides. Nucleic acids, transfection reagents and the lipoplexes formed by them are known to adhere to plastic surfaces. Redevelopment of the transfection reagent METAFECTENE® μ was required to solve these problems. 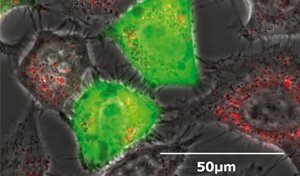 GFP expressing HepG2 cells with perinuclear rhodamine-labeled lipoplexes, high resolution live cell imaging with the µ-Transfection Kit VI FluoR. 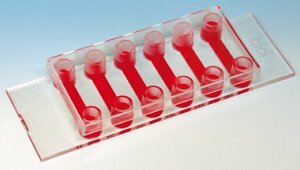 The reagent enables transfection to be performed effectively in μ-Slides using a rapid, simple standard protocol (without optimization) for a wide variety of cell types. Thanks to METAFECTENE® μ's special composition and low toxicity, even thinly seeded cultures which proliferate only slowly can deliver good transfection results. Biontex also developed a rhodamine-labeled version (METAFECTENE® μ FluoR) specifically designed for users interested in tracking the carrier system. The combination of μ-Slides with METAFECTENE® μ in the μ-Transfection Kits thus enables cell culture, transfection and high-resolution microscopy to be performed directly in the culture vessel itself. But not only transfections can be performed in μ-Slides: proteofection too, with all its benefits, can be carried out in μ-Slides to permit high-resolution microscopy. Both PROTEOfectene® and PROTEOfectene® AB for antibody proteofection were optimized for use in μ-Slides with a broad range of cell types and proteins. Offering simple, intuitive operation and ultra-rapid protocols, the μ-Proteofection Kit VI and μ-Proteofection Kit VI AB are therefore ideal for studies of enzymes and antibodies in the field of proteomics, where microscopic observation is routine. 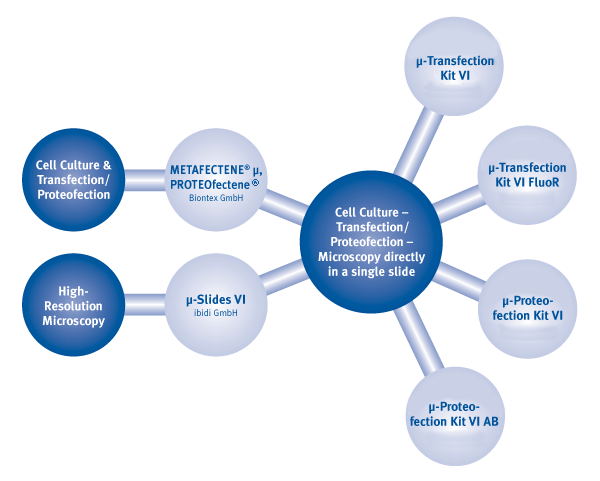 The combination of μ-Slides with PROTEOfectene® in the μ-Proteofection Kits thus enables cell culture, proteofection and high-resolution microscopy to be performed directly in the culture vessel itself.